t*rexes and tiaras: candy cane girl.. Yesterday was one of those days when it was just too hot for proper shoes. I honestly can't get enough of the gorgeous weather we've been having, but one of my pet hates is my feet getting too hot, so in weather like this I usually stick to sandals. 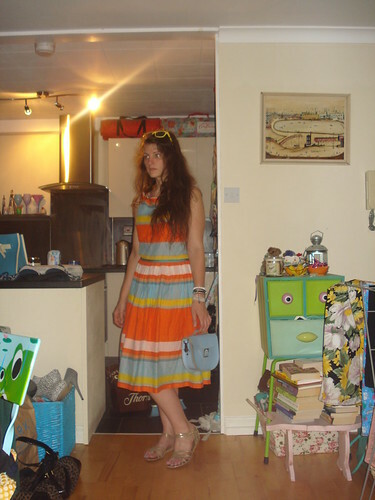 This dress never fails to make me feel summery; the stripes remind me a little bit of an ice lolly. Looking back at the pictures, it's clear it needs a few darts putting into the bodice (it's been a long while since I last wore it) but I think that I'll do that rather than get rid of it. I've been trying to be a little more ruthless with my wardrobe, lately. I figured that my pretty Brit-Stich satchel deserved to see some sunshine, too, since it matched my dress so well. This week has mostly been spent swimming, gymming and baking an endless supply of cakes and biscuits for the quiz which the Rangers have planned for the weekend. I've been quite impressed with the work the girls have put into the questions (they've prepared a round each) and the plans they have made; now all we need is for plenty of people to show up! 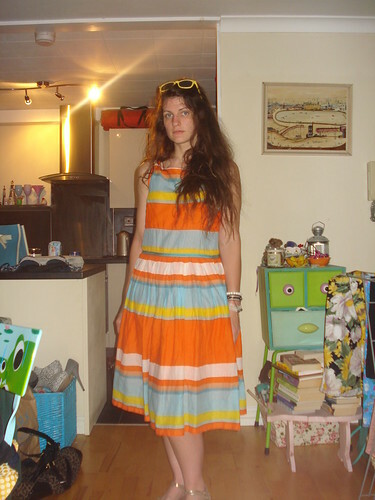 Char, I love this dress, the colours are so lovely on you! 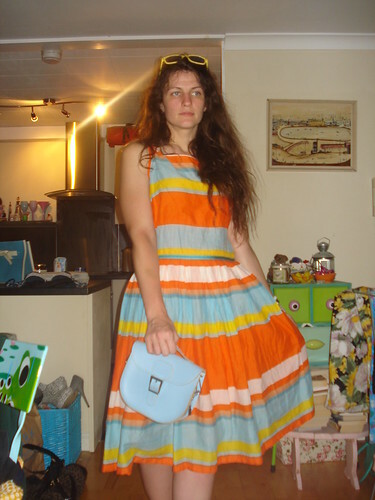 Great summery colours, and your bag matches perfectly! Love it when things like that happen.